We often see celebrities looking like the millions of dollars they are worth on the red carpet. They arrive at an award show or event with every inch of their body buffed and readied and draped in stunning designer duds. The other side of a celebrity is who they are when the makeup is off and the heels turn to flats. When they are with their family and friends or just wandering by themselves on the streets of New York or Los Angeles. There is a whole other, more casual, side to Hollywood’s biggest names and we put them side by side with the most glamorous versions of themselves to compare the two looks. Sandra is without a doubt a natural beauty. Her red carpet style is very simple and sleek, while her street style is all about comfort and basics. Bullock is often seen in jeans and a T-shirt, or shorts and a tank top. For her, it’s all about looking cute but being practical about it. We love that both of her looks, be it sleek and shiny for an event or grunge down on the day to day, Sandy is just the bee’s knees. Charlize has gone through many makeovers and makeunders for her various movie roles. However, when it comes to her day look and night look, she also has a pretty big transformation on her hands. Theron loves to walk around town when she is off work in plain jeans and a top, while on the red carpet she is always a bronze goddess who’s dressed by the very best designers. This red number was from the 2016 Academy Awards. Jennifer Lopez has a tendency to look like she is going to a red carpet even when she is just going to dinner with friends. Here we found her more casual approach to being casual – a denim jumpsuit. She always looks put together no matter where she is and what she is doing. On the red carpet, like this yellow number she wore to the 2016 Golden Globe, Lopez pulls out all the stops. We still think back to that Versace dress she wore with P. Diddy, but this one is also quite breathtaking. We absolutely picked the photo where Celine is wearing a Titanic sweatshirt! Even when she is dressed down Celine is able to handle herself like the true diva she is. With everything Celine has gone through with the illness and then passing of her husband, she has always maintained her composure and class. On the red carpet, though, is where Dion truly shines. She is treated like and walks about with an air of success and style, always wearing something very chic and befitting the frame of the very tall and slender doll that she is. There has been quite a style metamorphosis for Blake Lively. While she has always had her witts about her when it comes to her style choices, she had come a long way from her Sisterhood of the Traveling Pants days. Even when she is off the clock and doing her own thing she looks like a million dollars. On the red carpet, she completely pulls out all the stops. This blue dress was her Cannes Film Festival dress, appearing like a mermaid all the while being a few months into her second pregnancy. Radiant! Gotta love a woman who seems as though she is always comfortable in her own skin, and it shows! When Natalie Portman is walking around New York City or Los Angeles, she usually has her hair up and what seems like very comfortable clothing on. She is very simple in her personal style but it suits her so well! On the red carpet is where she gets more experimental; she adds color and texture, not to mention shine and heels! Rachel McAdams has a closet we would all love to jump into. Her street style is a combination of edgy and practical, with her staple leather jacket and jeans. Rachel’s movie roles seem to inspire her daily wardrobe choices – remember her in The Notebook or in Spotlight? She was such a sensation. On the red carpet, she shows us what happens when you give her some time to prepare and a seriously incredible dress to slip into. She is natural and beautiful and confident. Kristen really is one who does a total 180 flip from her day to day wear and her Hollywood award show or event wear. If she could, Stewart would wear nothing but jeans, T-shirts and black All Star sneakers – she’s said so herself! This is why we always see her in her downtime uniform of just that. On the other end of the spectrum are the moments she is representing Chanel (she is the face of Chanel), going to a Hollywood event or red carpet. Stewart sure cleans up well and wears her heels like a pro! Whether her hair is short or long, straight or curly, Halle Berry ALWAYS looks on point. Berry has been laying relatively low over the past couple of years but we see her on red carpets and events when all of the celebrities come out to play. Berry’s casual attire is a mix between comfortable and whimsical, like this chic leather, ripped jeans and T-shirt look. On the red carpet, however, she is all about glam. Berry has always brought her A-game to these sorts of events and we don’t think she will be stopping anytime soon. Listen, Britney made it through a lot and has come back from the very lowest point you can be in Hollywood back to the bright light of stage lights. Spears’ casual look is always a mystery as she seems not to care in the least about how she looks when she walks out of her home. We have seen her in her gym clothes, in shorts and boots (we will never understand that one) and the occasional impressive casual look. When she goes to events, though, it’s a whole other story. Spears is always prepared to perfection when she steps on that red carpet- hair, makeup, shoes, and dress all fitted to a T.
Scarlett is one of the women in Hollywood who have the ability to make anything look good. Her daytime look is chic and effortless, even slightly hipsterish if you ask us. She is always around New York City with friends and family, looking as adorable as can be. When she decides to take part in one of Hollywood’s events, she pulls out all the stops and comes looking like a model right off of the pages of a spread. This dark green look is from the 2015 Academy Awards, and man, does she look incredible. First of all, Julia Roberts can do no wrong. End of story. What Julia Roberts can do is be very different in terms of her red carpet and day to day looks. On her own time, Roberts is always in something that is very appropriate, comfortable and not necessarily the most flattering. It seems as though she cares more for other things than style, which is completely cool. On the red carpet, however, she is one of the shiniest stars there are! Roberts is always in some incredible gown, wearing an insane necklace (just look at this emerald number) and makes us look at her with awe. Is it even possible for Jennifer Aniston to look anything less than perfectly put together? We have never seen a hair out of place, a dress too tight and a scowl on her face. When she is on the red carpet she likes to keep her hair pretty natural, her dress is always sensational and she seems at ease and comfortable in herself. When she is home and just wandering around she seems even more at ease and somehow even more beautiful than when she has the full red carpet regalia at her feet. We love Mila Kunis, we really do, but there is a huge difference in her appearance between her daytime and nighttime red carpet look. During the day she is usually without makeup (an admirable move) and is usually in something flowy or just plain jeans and a top. On the red carpet, she is a vixen. Kunis has her hair in all sorts of different ways, her attire is always impressive and her makeup makes her look like she isn’t the mother of two young children. Here we see her with a cool top bun and a very chic strapless dress. Beyonce is the queen. There is a reason people call her Queen B. When she isn’t busy touring or attending events, B is relaxing with her family and is seen walking the streets with more style than we hope to have. She always wears tons of color and her hair changes by the day. Her event looks are the impressive ones. She has been in latex dresses, metal arms and this stunning velvet strapless gown with extremely beautiful (albeit very heavy) earings. Her hair is pulled back in this one but there are other events where she has had it down, or to the size, short and long, you name it! Reese is the All-American of American fashion. Reese’s career has been on the up and up throughout her long career, and her style has been on the same upward path as well. When she is off-screen, Witherspoon is seen in sundresses, boho chic looks and ALWAYS with every hair in place. Her new venture, Draper James, is a retail brand that has her wearing and designing much of the classic designs she is seen in. On the red carpet, she is a vision in colorful ensembles and sleek hairdos. 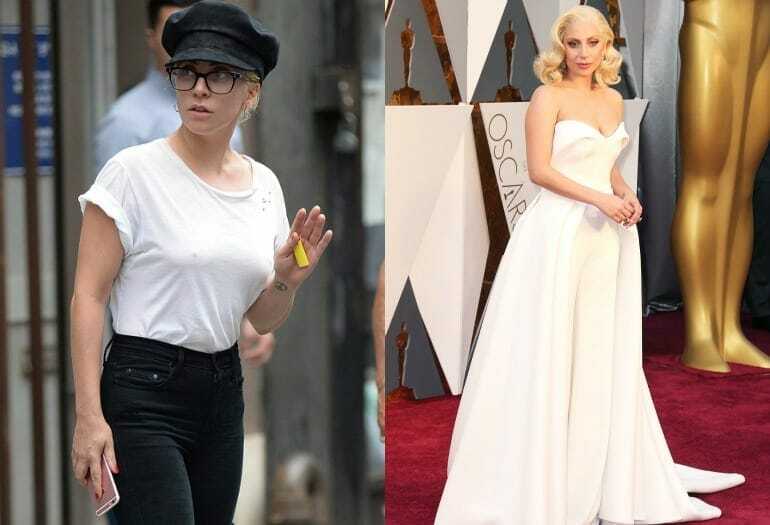 When it comes to style, Lady Gaga’s is the strangest no doubt, but who said a little risk in the fashion department is a bad thing? Gaga’s recent shift into a more demure and down low style icon is making more waves than when she came out of an egg. Walking the streets of New York City, Gaga is in denim short shorts or jeans and a T-shirt, with an adorable hat to match. Changing up the meat suit for a white gown, here we see Gaga in her most regal yet. Anne sure is no longer the young woman from Princess Diaries! Hathaway is now an Academy Award winning actress who has taken her style to a whole new level. She is all about the basic clothing, being comfortable and stylish is the most important. Her red carpet looks, though, are always just plain awe-inducing. Just look at this look that isn’t even a full red carpet but still looks like something out of the 1920s. What a vision! Although Jessica Alba has taken a slight leave of absence from her acting career to pursue her other project, Honest Company, and Honest Beauty, she is still seen all over the street and Hollywood events. Her style is one of the sharpest around. She knows what works for her and how to look fresh and rested while flowing around the city. Her hair is always done and her smile is always bright. On the red carpet, her hair and smile are the same but her clothing and makeup is on a whole other level. She is always looking like a golden statue. Country singer and actress LeAnn Rimes has a figure to boot and a smile that makes people weak at the knees. Her street style is simple and pretty, very country-esque if you know what we mean. Her red carpet looks are just as free-spirited but with more time spent on her hair, makeup and deciding on what to put on that gorgeous figure of hers. The white dress she is wearing here and the way her hair is, is the epitome of her signature style. Jennifer hasn’t been in the Hollywood scene for a very long time but she has certainly learned how to put her best face forward. She cares little for people’s opinions so she wears whatever she feels like when she isn’t styled on the red carpet by a stylist. She likes to wear black, sweatpants, and a long list of styles that work with any event she goes to. On the red carpet, Lawrence is radiant every single time she walks out of her car and onto the stream of photographers. 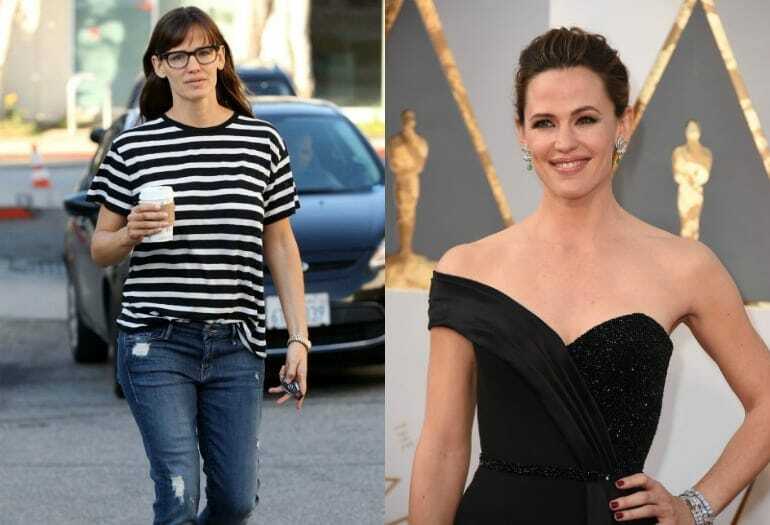 Jennifer Garner is one of the rarest beauties, she doesn’t need makeup to make her shine. Garner is also one of the most down to earth celebrities who goes to red carpets and events as part of her JOB and not a way of life. When she isn’t on the red carpet, Garner is seen walking her kids to school or to dinner and is all about comfort in her personal style. The red carpet look that Garner comes out with is one of the most beautiful to see because she is so natural and comfortable. Here we see her in a black strapless gown (designer no doubt) and jaw-dropping earnings. Miley. What can we say about Miley? Her personal style is on the spectrum between strange and surprisingly stunning. She can do it all and somehow pull it off. On the left we see her running about her daily life looking grungy and comfortable. On the right we see her on the stunning end of the spectrum, wearing a white suit and her hair combed over in a very chic way. Adele can wear whatever she wants as long as she keeps on singing the way she does. Seriously, though, Adele’s personal style is very large clothing that are comfortable (even though she has lost a lot of weight since her introduction to Hollywood she still loves the baggy clothes). On the red carpet, she goes for a more fitted look and is looking healthier and more glowing as ever. Harry Potter star Emma Watson has come a long way since her early days as Hermione. Her street style is bundled and college student like (she has a thing for overalls) and is a fan of oversized sweaters and T-shirts. Her red carpet uniform is one of couture dresses and sleek hairdos. Here we see her wearing a couture gown, with her hair sleeked back and her makeup as natural as if she isn’t wearing any (but totally is). Jessica got a lot of slack over the years in regards to her weight. She fought back and won when she revealed a seriously fit physique. She loves wearing heels ALL THE TIME, as you can see here on the left. Her usual style is very cool, calm and collected – you will never see her without her sunglasses on. Her Hollywood style is a combination of classy and more exposed, depending on the event. The singer loves up dos and longer dresses, showing off her fantastic new figure. We had to put Angelina on this list, her style and beauty are legendary. Hollywood is only one aspect of her life, she is also involved with the UN and attends many meetings where she needs to have a certain attire when being presented. Jolie likes to wear flowing things, nothing tight and is most often seen in spaghetti strapped shirts and long pants. Here we see her in a longer sleeved blouse and pants but she is always put together. On the red carpet, she is a vision in every color she decides to wear. Here, a yellow sight for sore eyes, Angelina is at the Canne Film Festival. Gwyneth’s street style is far from grunge or street at all. She is seen in sleek shirts and pants, or the occasional casual dress. She truly shines on the red carpet, draped in designer clothes and being one of the very few celebrities who love to give interviews (about her business, not about her family or personal life). Paltrow can wear whatever she wants and she will still look as chic as can be, it’s a gift of hers. Drew has been in Hollywood since she was just a little kid (remember ET?) but her style has also gone with her along her journey in Hollywood. There were a few questionable years there, but her personal style has come a long way to a more bohemian and flowery look. Her red carpet and event looks vary tremendously, but are also similar to her daytime look in their genre – frilly, boho chic with a side of fairy dust. Selena may be young but she has already solidified her status as a style icon. On her own, she is wearing a mix of styles, from boho and resque, to chic and conservative. She likes to mix and match as much as she can and always pulls it off. On the red carpet, Gomez plays it safer but just as stunning. Her gowns, like this purple one, are usually couture and always made to fit.